The Benefits Of Reiki - Fit, Healthy and Fabulous! So, what is all the BUZZ about Reiki Healing Energy lately? Everyone is talking about this amazing healing practice, I get it, I am Reiki Master Practitioner who gets to experience this amazing healing, positive energy every day. Reiki is the gift of perfect energetic balance to all living beings. Practicing Reiki supports balance and harmony on all levels. It benefits ALL living beings, people, pets and wildlife too! Healthy or sick, happy or sad, Reiki healing energy helps bring balance and restores the body from the inside out! Reiki is an ancient Japanese form of healing with energy, it is a powerful healing technique that was developed by Dr. Mikao Usui. Dr. Usui developed these powerful Japanese healing techniques in the late 1800s. Reiki (“RAY-kee”) is a Japanese word meaning “spiritually guided life force energy.”​Reiki can be used to improve and maintain your health. Reiki is a great way to reduce stress and improve your overall health and quality of life. Many people use Reiki to reduce stress in their everyday lives and just to relax. Reiki encourages a positive connection between the mind, body and spirit while increasing a calm state and encourages a natural healing process within the body. ​​ There are people who have weekly Reiki treatments for stress reduction and as a form of meditation. Reiki helps balance out the energy (Chi) in our bodies, in turn helping us live a more positive and healthy life. Reiki embraces the unseen energy that flows through all living things, it restores balance and peace to the body and mind. All living things are made of energy. Reiki creates many beneficial effects including feelings of peace, security and well-being. Reiki helps to restore order to the body, mind and spirit. It brings about a very deep relaxation, removes energy blockages, detoxifies the body, provides a new vitality in the form of healing universal life energy. Reiki increases the vibrational frequency of the body and chakras in turn helping the body to function at a higher more positive level. Reiki is not a religious practice but it is spiritual in nature. Reiki is a spiritually guided life-force energy. 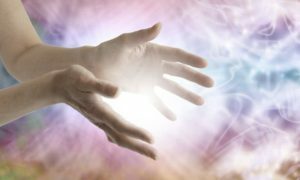 Reiki is administered by the Reiki Practitioner laying their hands on or above the recipient during a Reiki treatment. Reiki is gentle, noninvasive and powerful. Many people and animals experience a feeling of a hot or cold sensation during a treatment. Some experience a feeling of pulsing or a wave like feeling too. This is just the energy flowing where it needs to and working on specific areas that are in need of the energy during the treatment. Reiki is considered an alternative form of healing that is accepted by many in the medical community including Dr. Oz! Reiki is now being recognized and incorporated as part of therapy in many hospitals and doctor’s offices worldwide. Reiki can shorten healing time from surgical procedures and illness. Reiki can improve the results of any medical treatment. Reiki actually works in harmony with all kinds of treatments for people and animals too. Reiki can reduce negative side effects from chemotherapy, surgery, and medical procedures. Reiki can assist in cutting emotional chords that bind you and may hold you back in life. Many of us live with past regrets, abuse, insecurities and negative emotions that keep us repeating the same patterns in life that do not serve us well. Reiki can help remove those blocks and help you live a more positive, healthy life without all the clutter from the past keeping you from reaching your full potential. Reiki has also been used to improve healing from emotional trauma, post-traumatic stress and other forms of psychological issues. Reiki helps to get to the core of an issue, either physical or emotional to eliminate the symptoms. Reiki can assist in healing many physical and emotional symptoms and improve an overall sense of well-being. Our bodies are always healing themselves, Reiki treatment gives a direct energetic intention to the body’s ability to heal itself and be well. Reiki helps the body be aware of the healing process and utilize it to its full potential. As most Eastern medicine systems have proven, energy is everywhere, reacting from the outside and inside of our bodies. At the end of your Reiki treatment, you will experience a deep relaxation, feel a sense of peace, have relief from pain, feel healthier, emotionally balanced, more vibrant and recharged! You also may sleep better, have a stronger immune system and experience better health and a more positive outlook on life. The beauty of Reiki is that it is for everyone! It helps facilitate healing and increases positve, healthy energy in infants, toddlers, children, adults, the elderly and our beautiful furry family members too. This entry was posted in Animal Reiki, Health and Wellness, Lifestyle and Leisure, Meditation, Reiki, Reiki Healing, Reiki NJ and tagged Reiki, Reiki Energy, Reiki for dogs, Reiki For Pets, Reiki in New Jersey, Reiki Near Me, Reiki Ridgewood NJ.